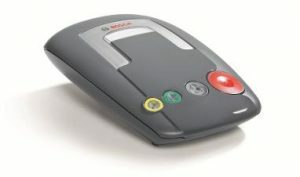 Pictured: A typical telecare two-way speech unit with integrated buttons. The telecare two-way speech unit, also called a ‘base-unit’ is effectively the ‘brain’ of your telecare system. It is the part that accepts signals from all other telecare devices in your home, including your pendant alarm. It is also the telecare two-way speech unit that connects to the 24/7 monitoring centre. It does so by using your home phone-line to dial through. Some types can connect to the monitoring centre using a mobile network, in which case no home phone-line is required. The unit is usually located in the hallway or bedroom of your home. It plugs into a standard electrical socket. Once you press a button on your pendant or another telecare device in your home is activated, telecare operators can talk to you and hear you, through the two-way speech unit. ♦ When any of your telecare devices are triggered, staff in the the telecare monitoring centre can tell which device in your home has been activated. They can inform you of which telecare device is sending the alert. They can also call one of your key-holders or the emergency services to get help to you. ♦ If monitoring centre operators do not hear a response from you, they will first try calling you back to your home or mobile. If they can not reach you, they will call one of your nominated key-holders (usually a neighbour, family member or friend). The telecare devices around your home generally connect by radio signal to the two-way speech unit. No wiring is therefore required. What type of telecare equipment connects to the two-way speech unit? Telecare devices that can connect to your base unit include your pendant alarm and many other devices that can be activated such as mounted panic buttons, pull cords and door exit alarms. Telecare monitored environmental sensors can also be added to detect smoke, carbon monoxide, heat, or water leaks. The different types of telecare equipment that can connect to your two-way speech unit, can be viewed on our telecare equipment list page. Or you can have a look through the below presentation (from page six onward). Some telecare companies charge for monitoring of each telecare device separately. Others don’t. Always check this when buying your telecare base-unit. You don’t want to end up paying extra if you don’t have to. People add extra devices as their care needs change. For instance, a pull-cord or water leak detector in the bathroom could be added as an additional safeguard if you forget to wear your pendant alarm. Do all telecare two-way speech units have the same functionality? Many different makes/models of telecare base-unit are available and each will have different functionality. Some can accept signals from only pendant alarms. Others accept many more telecare devices. For instance, the TeleAlarm Carephone 62 can take in signals from twenty telecare devices. The relevant standard for telecare two-way speech units is part of the European EN50134 series of standards for Social Alarms. If the base-unit meets this standard, you can be assured that it will have many added safety features built in. These safeguards are important. They could save your life some day. Certain features are more critical for you to know about than others, for instance, the number of times the unit will dial through to a monitoring centre if the first call fails. Another important function concerns the battery backup, to ensure your alarm functions in the event of a power cut. The longer it lasts the better. A few hours backup may not be enough, for instance if a power cut happens late at night. Some of the important safety features under the standard are outlined on our telecare standards page. You should familiarise yourself with these safeguards before you buy an alarm. And ask suppliers if their telecare equipment meets the minimum standard. Will any telecare equipment connect to any two-way speech unit? Not all telecare devices will automatically work with all two-way speech units. Most will only read signals from telecare devices from the same manufacturer. For instance, if you have a Bosch two-way speech unit, and purchase a flood detector from Chubb or Tunstall, it is unlikely to connect to the Bosch unit. Similarly a Chubb or Tunstall two-way speech unit will be unlikely to read signals from a Bosch flood detector. To make matters more complicated, just because you buy from the same manufacturer, doesn’t necessarily mean that your two-way speech unit will work with their own telecare equipment. As always it will depend on the functionality of your particular base-unit. To find out which telecare equipment can be added to your existing system, contact the telecare company that carries out your 24/7 monitoring. They should be able to advise you about what other telecare equipment can be added to the type of telecare system you have installed. It is a good idea to ask telecare companies what other telecare equipment can connect to a two-way speech unit before you buy your telecare alarm. Then if your care needs change (which most peoples do) it’s easy to add extra telecare devices. How many telecare devices will connect to my unit? The number of telecare devices that can connect to your two-way speech unit will vary, depending on the make/model of your equipment. You can check this before you purchase the unit. Some base-units will only work with one pendant. However, most will accept signals from a number of telecare devices. What about safety and quality. Is there a telecare standard? The relevant standard for telecare two-way speech units is part of the European EN50134 series of standards for Social Alarms. If the base-unit meets this standard, you can be assured that it will have many built in safeguards. These features are important as they could save your life some day. Some of the important safety features under the standard are outlined on our telecare standards page. Who are the main manufacturers of two-way speech units and telecare? The main manufacturers of telecare equipment are companies such as Chubb, TeleAlarm, Bosch, Tunstall & Tynetec. These are all well known companies who have been working for many years in the industry. Telecare 24/7 monitoring companies are often affiliated with a particular manufacturer. Be careful about buying telecare equipment from any supplier you have not heard of before, if the equipment does not meet the EU Telecare Standard.